This wonderful slice of old Florida sits on the west side of Lake Okeechobee, in the tiny town of Palmdale. If you’ve heard of Moore Haven, you might get your bearings if you think about traveling another 10 miles or so west. The park is 18,000 acres of native Florida land and is home to some of the most beautiful birds the state has to offer. Here you'll find Ibis, Bald Eagles, Swallow-tail Kites, Blue Heron, rare Wood Storks, Great White Heron, Cranes, Egrets and Wild Turkeys. The creek itself is 52 miles long and challenges fishermen to catch bass, crappie, catfish, brim, armored catfish and tilapia. In case alligators and birds don't satisfy your quest for Florida's wildlife, look for red-eared turtles, wild deer and boar wandering through the cypress trees at Fisheating Creek. Even Florida Panther and Black Bear roam freely about the park! Both primitive (tents) and full hook-up RV sites are available at the Palmdale campground area. For campers who have forgotten night crawlers, toilet paper and pickled pigs feet, the little country store in the camp office can provide all the necessities. The cooler winter months and weekends are busiest, so make a reservation early. The creek starts up north in Highlands County and runs through forests, pastures and marshes, and finally reaches Lake Okeechobee. The first known settlers at Fisheating Creek, going back between 1000 and 500 BC, used its resources as a canoe highway leading to Lake Okeechobee. Around the 1500's, as the Spanish began to arrive in Florida, a group of people known as the Guacata occupied this area. These were the original descendents of the Belle Glade people. At this time, the area was still in a natural state; unexplored and undisturbed. It wasn't until the mid-1800's when enslavement, disease, war and religious conversions started to create change. Native Americans from central Georgia made their way to this area and eventually replaced the original people. These people were short-lived; they were removed during a series of Seminole wars from 1817 to 1858. Now we get back to the Lykes Brothers. At the time, they were the largest producer of cattle and the biggest meat packer in Florida. They began buying up this land in the 1880's. The cowboys who worked the land were known as "crackers," supposedly from the sound of their whips. The last remaining Seminoles who lived at Fisheating Creek were forced to leave around 1930, as cattle ranching and a sugar refinery at Moore Haven were established. At first, all was well. The Lykes brothers prevented development along the creek and kept it open to the people, offering a campground and canoeing concession. However, in 1989, Lykes closed the creek to the public and ignited a 10 year legal battle. 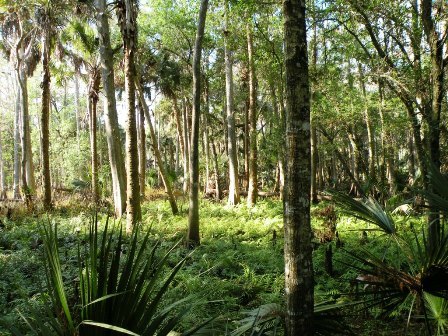 The litigation ended with the state of Florida purchasing 18,000+ acres and creating the Wildlife Management Area. Just about the only thing staff will DISCOURAGE you from doing is swimming in the creek. Even at low water, you'll see alligators partially submerged in the water or sunning themselves on the banks. For swimming, the staff suggests a cool refreshing dip in Spring Lake, the spring-fed lake at the back of the park. This is also a designated primitive camping area, with covered pavillions and picnic tables. So for a wonderful taste of the way things used to be, pack the camper, the kids, the fishing rods and the canoe and visit Fisheating Creek in Palmdale, Florida! 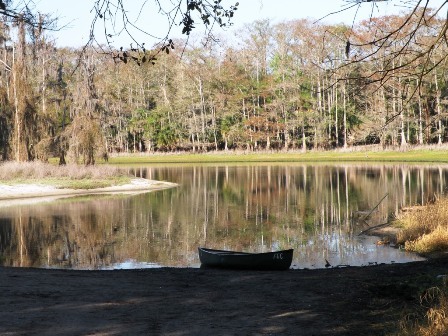 Looking NW from the primitive camping area, here is a canoe waiting to be rented at Fisheating Creek. Walking through the trails, this is the hammock area you'll pass through, from the campground office to the primitive camping sites. There are 16 kinds of bromeliads that grow in Florida. 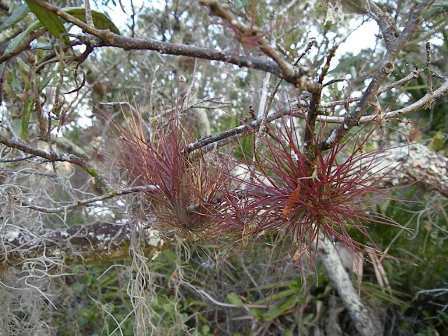 These plants are members of the pineapple family and grow mostly attached to the tree's trunk and branches. They do not harm the host tree. Most bromeliads collect water between their leaves and may also serve as a habitat for small animals and/or a water source during the dry months. 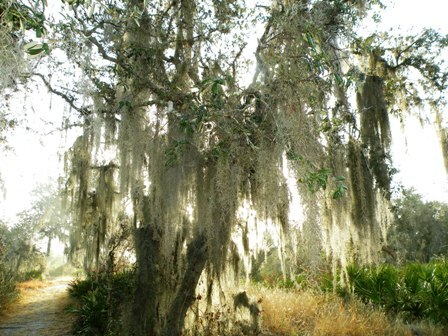 Live oak, often covered with moss, are the predominant tree of the hammock portions of Fisheating Creek. You'll also find tropical species like strangler figs and gumbo limbos, mixed with cabbage palms.